A Mexican businessman accused of financing the jailbreak of Mexico's most notorious drug lord has been sent to prison pending trial. Prosecutors think Manuel Trillo helped Joaquin "Shorty" Guzman break out of the Altiplano jail in July. Now Mr Trillo has been sent to that very same prison. 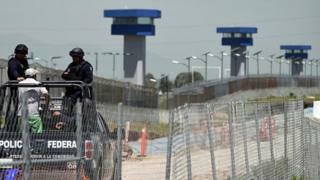 A manhunt is under way to catch Guzman, who leads the Sinaloa drug cartel, since he escaped through a 1.5km-long (one mile-long) tunnel on 11 July. According to investigators, Mr Trillo is the financial operator of the Sinaloa cartel and bankrolled Guzman's escape. He is also accused of using illicit funds to purchase properties from 2012 to 2015 under false names. More than 30 people have been arrested in connection with Guzman's escape, including the prison governor and several guards. Guzman's arrest in February 2014 was seen as a coup for Mexican President Enrique Pena Nieto. The cartel leader had been on the run for 13 years since escaping from another maximum security jail in 2001, reportedly hidden inside a laundry cart. But his spectacular break-out from the Altiplano prison caused huge embarrassment. Video footage showed how guards failed to detect his escape until more than 20 minutes had passed. Questions have also been raised how the prison authorities could have failed to notice the construction of the tunnel leading directly into Guzman's cell. On CCTV footage leaked to the media, the sound of drilling can be heard reverberating through his cell. Investigators say Guzman's associates must have been planning the jailbreak since shortly after his arrest. Not only would the construction of the tunnel have taken time, but Guzman's associates also purchased a plot of land outside the jail and built a house to disguise the tunnel's exit. Attempts to recapture Guzman have so far failed although authorities said he was injured when he narrowly escaped from a police operation last month. He is believed to be hiding in his home state of Sinaloa, in north-west Mexico.